As important as your garage door is to your home, many people don’t realize how dangerous it can be. If you aren’t careful, you or a family member could be seriously injured or even worse. 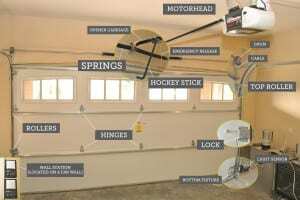 But if you follow these garage door safety tips, you and everyone else in your home will be safe and secure. There are certain components that can be a hazard and must be treated with caution at all times. Here are a few of them. Moving Parts – Doors have several parts that have to work together in order for the unit to operate properly. Unfortunately, these components can often crush hands and fingers, and also ensnare loose clothing. One of the most important garage door safety tips we can provide is to remind you to always stay away from any moving parts, as well as cables and springs. This is particularly important for children who may be curious about how the door works. Openers – A child may think that the opener is something to play with. If you have a mounted opener, please make sure it stays beyond a child’s reach. Always keep remote openers safely away from kids. Familiarize Yourself with the Emergency Release Mechanism – It’s extremely important that you never allow children to play any sort of games anywhere close to the door. Sometimes, they may try to slide under the door before it closes – this, of course, is extremely dangerous because they could become trapped. You need to not only know where the emergency release is located, you also need to know exactly how it works should something happen. One of the ways you can ensure that your door remains safe at all times is to have it checked by a trained professional. At Action Garage Door, we have several years of experience and we know exactly what needs to be done in order to keep you and your family secure. To schedule a maintenance call or to get any other information regarding garage door safety tips, call us at one of the numbers on this page or contact us online.